These are a pair of 1/48 Academy models Challenger 1 tanks. They are meant to give my Modern British some heavy support. Here ‘s how they look with the Imprint Models Warrior MCVs. Ready for some combined arms action!! Against whom… um… well, I guess I have to work on that next. Since I’m on a roll with the modern British stuff, maybe I should finish up those last two Warrior MCVs…? 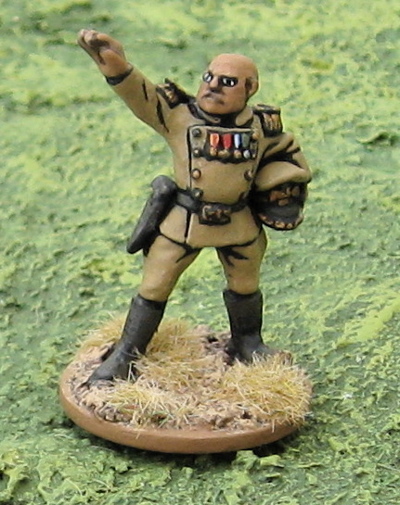 My kids have been hounding me about when I’m going to let them paint some figures for some time. 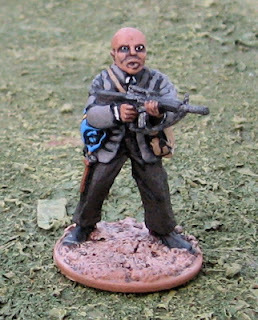 Over the holidaze I finally broke down and bought two sets of Wargames Factory zombies for them to assemble and paint. I figured zombies would be good place to start as it wouldn't matter if they looked a mess. They're Zombies. They're SUPPOSED to look a mess! Can you tell who did which ones? These are Keira’s. She is six. These are finnegan’s. He just turned nine. Not bad for first attempts EVER – certainly far better than my first minis! 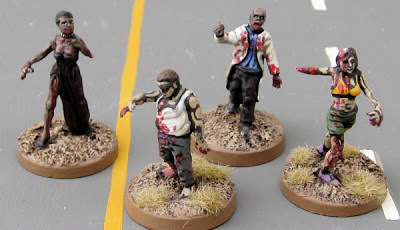 These are the ones I painted. 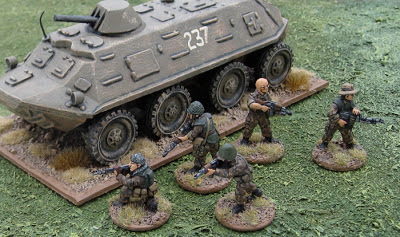 I have some armoured vehicles on the workbench and have to finish up a Pak40 for our first stab at Bolt Action this weekend! Of course, now that the kids are painting – I have an excuse to paint toys during the day!! I also repainted all FN furniture (fore and aft stocks) on all my Cold War British armed with the L1A1, as I’d been painting them a dark brown to look like wood (as they would have been originally issued). After having a long look at a number of pictures it seems to me that the original wooden stocks were replaced sometime in the 70s with black nylon. The lot of them (the new ones, that is…). 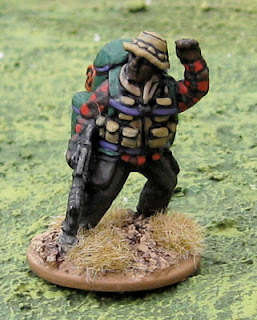 Some Special Forces – SAS or Marine Arctic & Mountian Warfare Cadre. 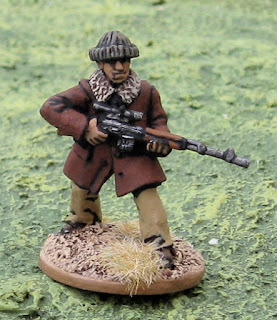 Some of them are just from regular infantry packs, but I ordered the knit cap head option to pass them off as SF. 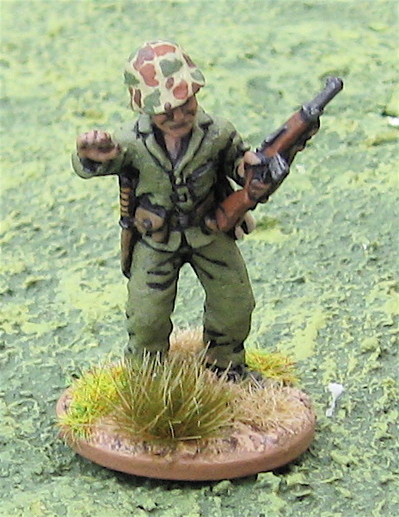 Marines from NLP8901 – ready to defend the Falklands against the initial Argentine invasion. These are all the Cold War British Special Forces types I have. Some are from Mongrel Miniatures. I think I should have enough to play the Top Malo House scenario from the Force on Force main rule book… I just have to make a house and paint the argentines… I’ll have to make some substitutions – or assume certain kit is hidden away in the packs of those carrying them – as the scenario calls for a number of troopers armed with M79 grenade launchers and M72 LAWs. 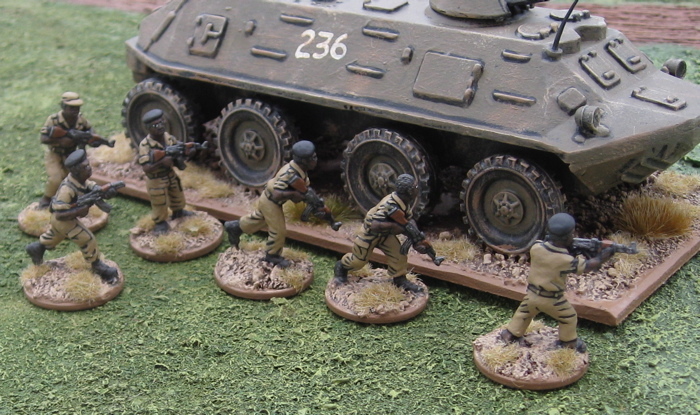 All the Cold War British regular infantry I have… Pretty much enough for a leg infantry platoon – and then some! (I think). I’d need a couple more Carl Gs for a mechanized platoon (and some APCs!!). 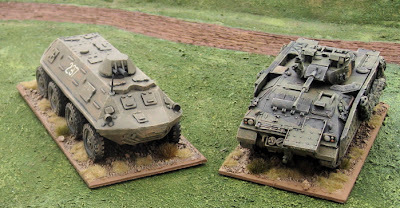 If I’m picking up some Carl Gs (form Mongrel), I’ll probably pick up a pack of SF-GPMGs and some Soviets… Then I just need a platoon of APCs… Saxons or FV432s? Anybody out there know what the organization of a British Light infantry (or Para, or Marine) platoon would have been in the last 70s early 80s? 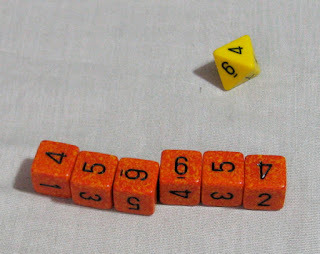 Would the sections have been 8 or 10 (in theory). I’m sure I saw at some point (probably 20 years ago) a TO&E that indicated that a leg infantry section carried both a GPMG and an L4 Bren!? Can anyone confirm or deny that? Am I totally smoking crack or something? I have a few spare guys with SMGs – perhaps for dismounted APC/Lorry drivers? 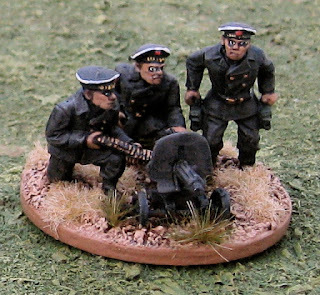 Some support weapons and Forward Observers. 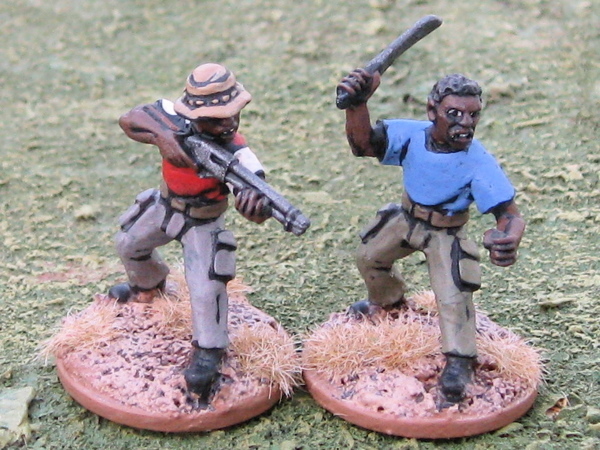 I also have four Gurkhas I picked up ages ago, just for fun. 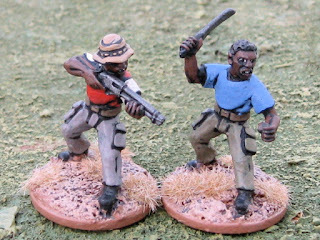 The only real difference between these and the other infantry from Gripping Beast is these packs come with a Kukri knife to glue on to their belt somewhere - you can just make out one on the kneeling chap on the left. I should have a post shortly about the kids first zombie figures. After that..? Argentines? Some new terrain? Three BTR-60s for my Russian/Soviet (or Russian/Soviet backed/supplied) forces. The handy thing about old Cold War Soviet equipment is it can be used for so many different forces…. 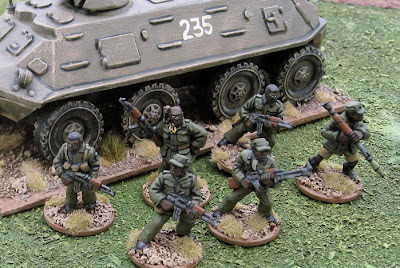 They absolutely dwarf the 1/55 S&S Models BTR-80 that I have. 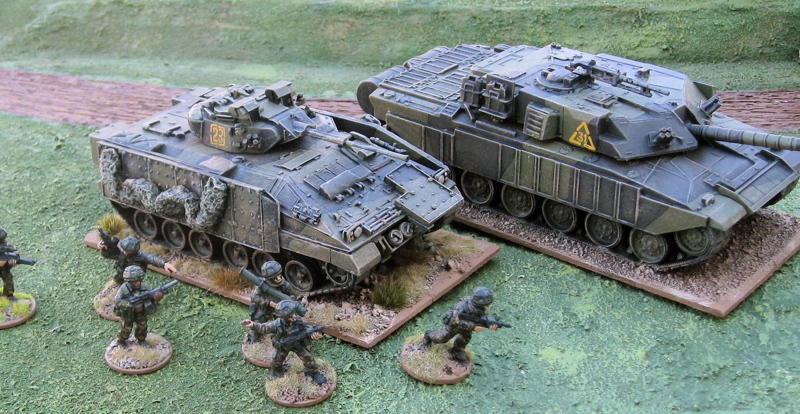 Another shot with the the Imprint Models Warrior MCV-80. Cold War British Infantry… They’re done, just need to take pics… Probably later today. After that…? Maybe the kids zombies…? More stuff rolling off the workbench…. 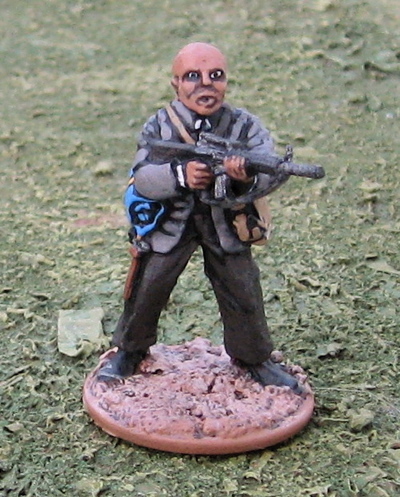 Another “Armed Office Worker” from Victory Force Miniatures. 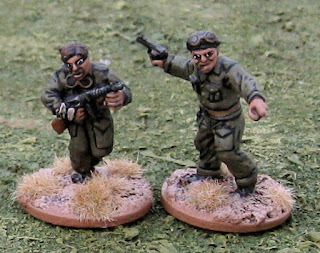 Another batch of Cold War era British from Mongrel Miniatures - this finishes off the Cold War British I currently have on hand. I did, however, order a handful more from Gripping Beast (along with some Argentines) which should be arriving presently (Ha! Actually they arrived while I was typing this!). I think I might, at some point, pick up another pack of Mongrel Carl G teams (as, apparently, there was one in each section!? I always thought they were a platoon weapon!?). Finally some support for my Soviet Naval infantry – a Maxim team, also from Black Tree Design. Oh, more of the same… Probably those new Gripping Beast Brits and Argentines. 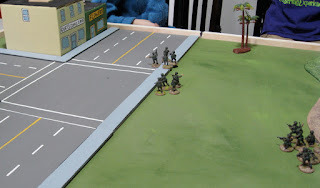 I ran a quick game of Ambush Z for the kids and some friends on Friday afternoon. It almost turned out a lot quicker than I’d anticipated!? 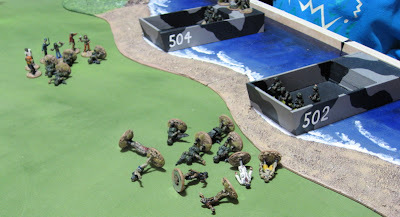 Royal Marines from an Amphibious Task Group are landing on the shores of Scotland to begin the reclamation of the UK after the zombie “invasion”. 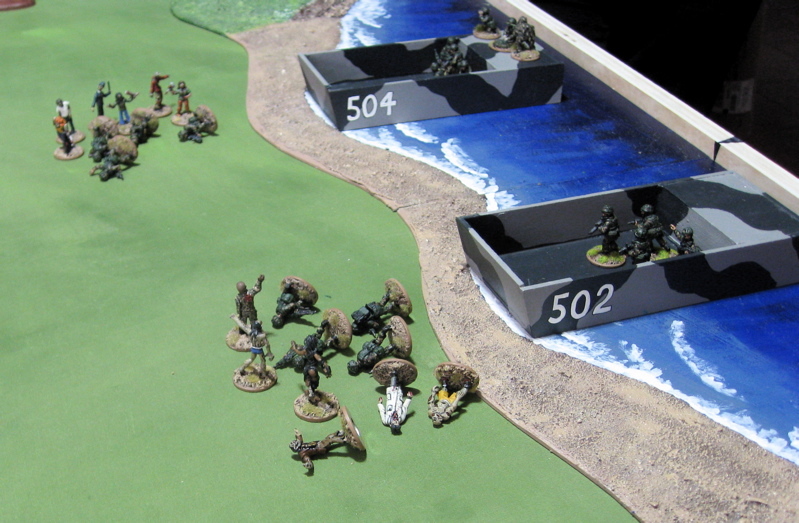 Clear the beach and first row of buildings to begin establishing a beachhead. Starting Set up – the Marines are aboard their landing craft… Zombies roaming the shore and street. Fire Team K stormed ashore! Before they could get shots off they were overrun by zombies. 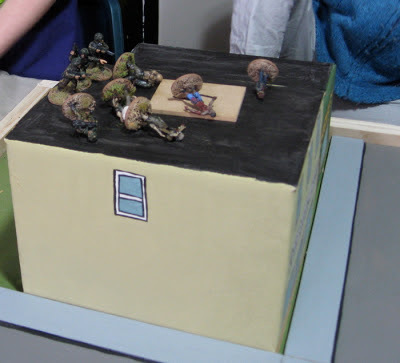 Teams F & S rushed to the front of their respective crafts and shot the remaining zombies. 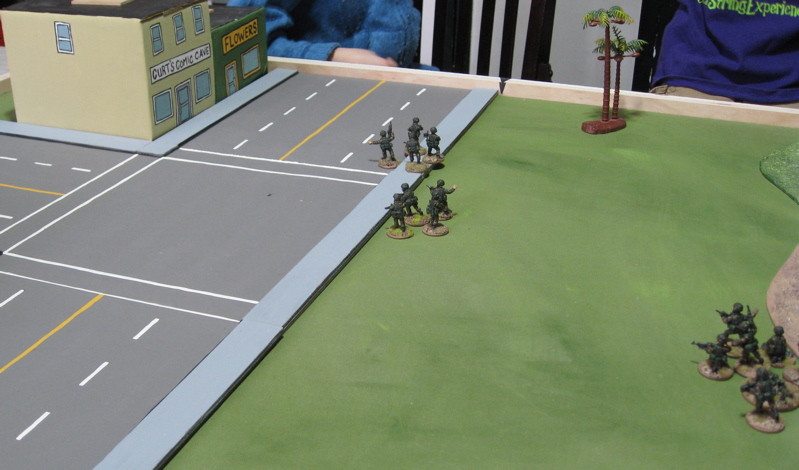 On Turn 2 the medic made it to Fire Team B and got most of them back on their feet. One seriously wounded, one lightly wounded, the other two were just fine – knocked down by the rushing zombies, but completely unscathed! The Sniper team started picking off Zombies in the street. It took a turn or two for the Marines to get on their feet after the initial shock of being ambushed as they hit the beaches. On the second turn the medic made it to Fire Team K. Casualties there included one dead, one lightly wounded, and, once again, the other two were completely unscathed! 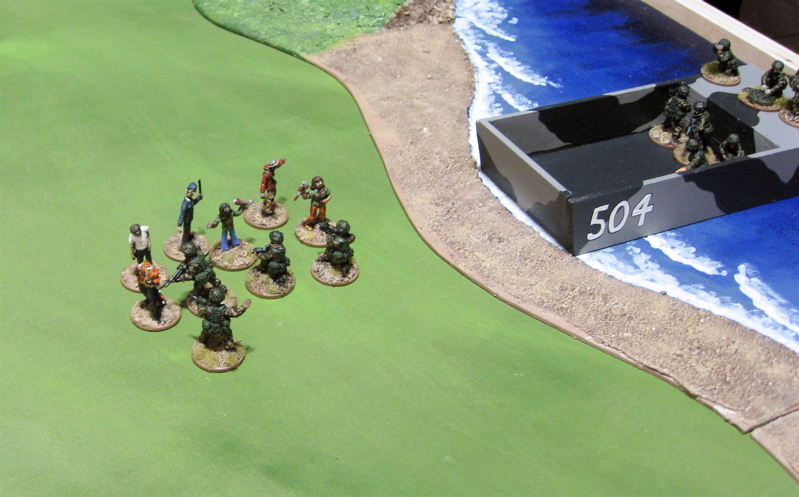 The four that were unscathed reformed a new team (with two grenade launchers and two GPMGs!?) 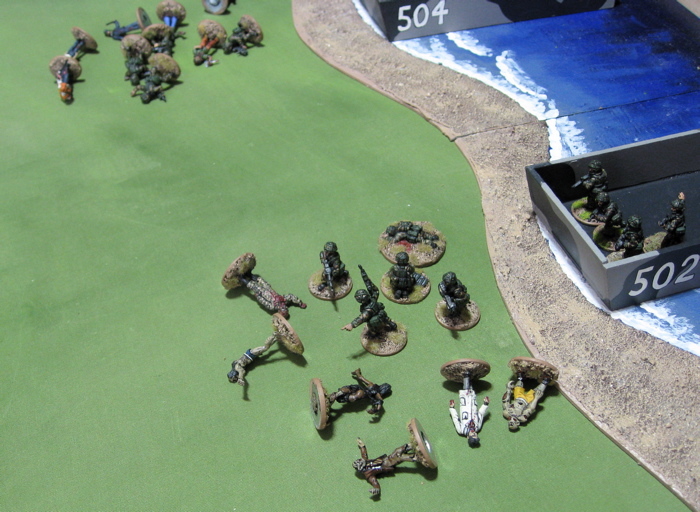 and left their wounded in the care of the Medic – who escorted them back aboard the landing craft. Teams F and S made their way past the mess of wounded and disorganized and rushed the buildings at the North end of their AO. Sniper picking off more Zomibes in the street. 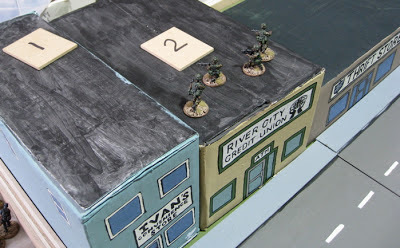 Just as they were about to reach the buildings a group of zombies shambled out and made a mess of Fire Team S! 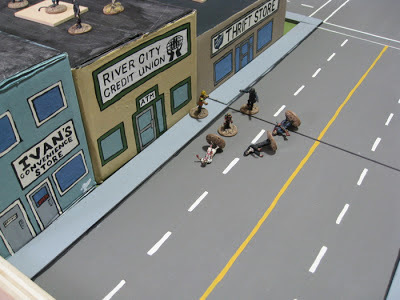 On the following turn, however, they did a first aid check and, once again, found two to be perfectly okay and the third downed member was dead. 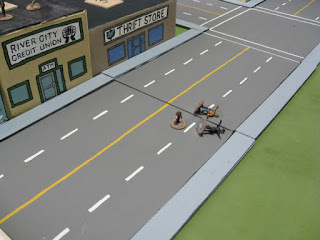 They rushed into the Comic Cave to clear it only to find MORE Zombies there and this tiem they were wiped out and no one was able to come to their rescue in time. Fire Team F, meanwhile, had stormed the Flower shop and cleared it. The reforemed heavy weapon team making a mess of the Zombies rushing them at the other end of the street. 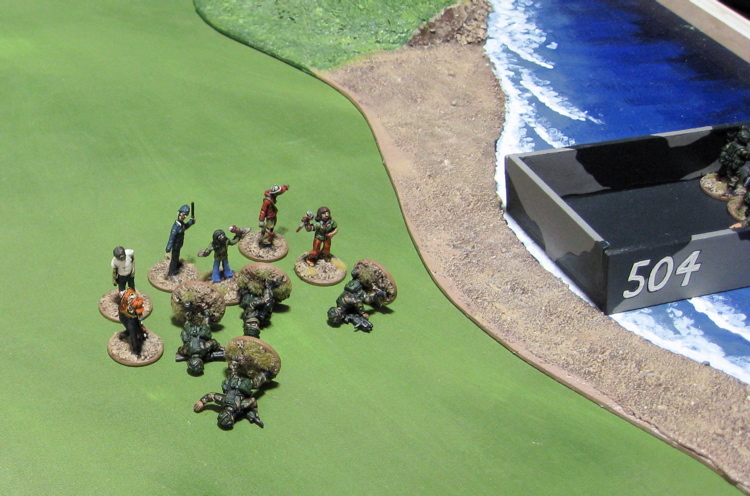 The amalgamated Heavy Weapon Team cleared the Thrift Store and was in the Credit Union at the end of the game. 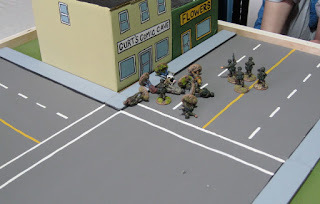 There were no Zombies on the table at the end of the game, three buildings/hot spots had been cleared, but two hot spots had yet to be cleared. 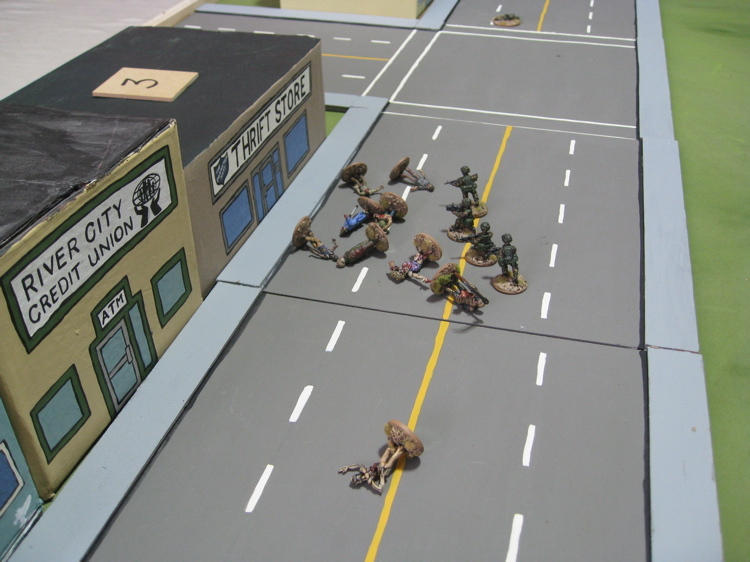 The Marines had suffered six dead, one seriously wounded, and two lightly wounded. Straight off things looked pretty grim, but the marines bounced back and did not too bad in the end. I hadn’t really thought of victory points for the scenario beforehand. I suppose there should have been points for each building cleared/hot spot removed and clearing all the zombies off the table by the end of the ten turn limit. Zombies would get points for killing Marines… but how many…?! I haven’t realy got my head around that part of scenario development. I did get a few things finished up over the last - mostly over the weekend. Most of these are from The Assault Group. 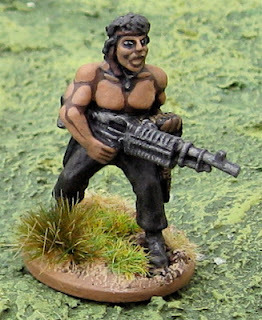 Another Assault Group SAS figure turned into a modern survivor. Some riot police. good for keeping rioters or zombie hordes in check... or protesters... or Canadian Hockey Fans... 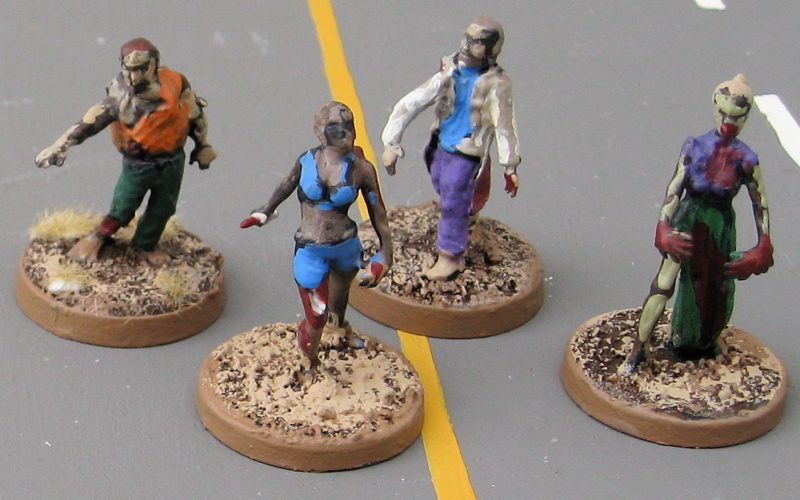 I originally painted their batons black, but it was just too much black stuff... so I went with making them wood.